Snow skiing vacations mean spending the whole day outdoors and participating in physical activities. Top Travel Tips looks at all aspects of skiing holidays. Like how to find the best ski resorts and locations, what do you need to pack for your ski vacation and why you need ski travel insurance? But first, why are ski holiday so popular? Maybe it is because it is difficult to think of a better way to take your mind of everything and just enjoy being... in the now. For many people, sun and ski is the perfect combination for a great holiday. Why Are Snow Skiing Vacations So Popular? There are many reasons why skiing holidays are so popular. Firstly, skiing vacation offers an escape from it all. You spend your days outdoors, actively participating in physical activities. There are few better ways to take your mind off everything else. With all your energy concentrated on getting safely down the hill, everyday stress and worries tend to melt away. The fresh air and the exercise usually mean physical exhaustion at the end of the day. Most holiday skier's sleep like babies... at least we always did. Snow skiing vacations appeal to wide range of people as the only criteria to enjoy skiing vacation is to enjoy physical activities outdoors. Skiing holidays are suitable for people of all ages. The best skiers are often those that are closest to the ground! This is why Family Ski Vacations are so popular. Kids tend to love active holidays and there are few holidays more active than snow skiing vacations. Better still... kids and parents can enjoy this activity equally. The grandparents might like it too. Skiing vacations are also great for groups of friends. It does not matter if you are good or not at skiing, everyone can enjoy skiing at his or her own level. It is all about improving your skills and enjoying the outdoors and then meeting up with the others at regular intervals. Skiing tends to fulfill our competitive nature. You can compete with your friends or family, or with yourself. You can get lessons and learn how to ski or pick up valuable skiing tips that help you to improve your skiing. Good ski training programs can help you to improve your overall ski fitness, allowing you to ski for longer and enjoy your skiing even more than you already do. You can ski all over the world and combine skiing with visiting new places and culture if you wish. US and Europe offer many of the best ski resorts in the world but there are many great skiing resorts to be found in Asia, Australia and S-America, and even in parts of Africa! There are different Types Of Skiing, e.g. 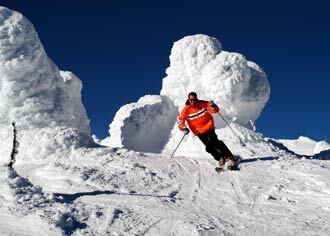 alpine skiing, cross-country skiing, snowboarding and you can find snow skiing vacations that caters for most of them. The number of slopes, their grades, the après-ski on offer and the style of accommodation tend to vary depending on the target market. There are family ski vacations and skiing holidays aimed towards group of friends or romantic couples. There are best ski resorts for learning how to ski or that offer the most variety of après-ski activities. There are luxury ski vacations as well as cheap snow skiing vacations. There are best ski resorts for beginners as well as best ski resorts for advanced skiers. Everyone should be able to find skiing vacation for his or her budget and taste. Colorado ski resorts are among the best in the world. Aspen ski resort is maybe the best known outside the US but there are many Colorado ski areas just as good. We have a closer look at some breathtaking Colorado Ski Vacations. Vermont's mountains are legendary and there are many good Vermont ski areas, both for Alpine and Nordic skiing. Vermont Ski Resorts are among the finest in New England and are great choice for luxury ski vacations. Skiing in Canada is great due to epic snowfalls, huge verticals, spectacular scenery, diverse terrain, expansive backcountry and mild winter climate. It is therefore no surprise that Canada Ski Vacations include some of the best ski resorts in the world... and if you are interested in heli-skiing, look no further. Many countries in Europe are excellent choice for luxury ski vacations. Classic European Ski Vacation includes picturesque historic towns, great slopes, beautiful scenery, fun après-ski, lively nightlife, luxury accommodation and gourmet food. Après-ski is French and means after skiing. When on snow skiing vacations après-ski refers to socializing after you have finished your skiing for the day. For many skiers, the après-ski scene is just as important as their time on the slopes. Après-ski is about relaxing with your friends or meeting new people. It can be over nice meal, having drinks together or going dancing. Everyone should be able to find après-ski activity to fit his or her taste and budget. Snow skiing vacations requires the right gear, i.e. skiing clothes as well as the right skiing equipments. You must dress appropriately for being outdoors in winter conditions. Specialized skiing clothes are great option, as they are designed to make you as comfortable as possible on the slopes. Our Skiing Clothes Guide gives an overview of what to wear when skiing and which features you should look for when buying your skiwear. Our Ski Jacket Buying Guide advices what to look for when looking at ski jackets. How to tell if it is weatherproof, what is the difference between jacket and shell, and other important features you should know about before buying your ski jacket. Good ski pants keep you dry and warm and protect you if you fall. Our Ski Pants Buying Guide goes through the features you should look for when buying your snow sports pants. Wearing Clothing Layers is ideal for snow skiing vacations, as adding and taking of pieces of clothing allows you to regulate your body temperature and feel comfortable at all times. Most ski accessories are essentials, not just nice to have. You should for example always use ski goggles and ideally ski helmet too. Other Ski Clothes Accessories that make you feel more comfortable when skiing include ski gloves, socks and neck warmers. Most children love active holidays so it is understandable why family ski vacations are so popular. Your kids skiing clothes play important part in protecting your child from the cold and keeping your kids safe and comfortable on the slopes. Which Kids Skiing Clothes Does Your Child Need? Your child will need weatherproof outerwear, good breathable under layers, and well fitted footwear. Your child will also need various ski clothes accessories to keep them comfortable and safe, such as ski gloves, ski hats, ski goggles, etc. Our Kids Ski Clothes Buying Guide will help you to find the right skiwear for your children. You can rent skiing equipment at all the best ski resorts. However, if you own proper skiing equipments then you should bring them along. You will need special ski luggage for your skiing gear when travelling to your ski resort. Ski equipment bags protect our skiing gear when travelling, whether by car or plane. Which type of Ski Luggage to get, depends mainly on your travel mode. Our Ski Bag Buying Guide explains what to look for when buying ski luggage. All about different material, the importance of padding, soft and hard ski cases, sizes, zippers, handles, wheels and warranties. Our free downloadable Ski Trip Packing List will make packing for your ski trips easy and quick. However, do not forget to check your airline luggage restrictions prior to packing your skiing gear. Participating in outdoor activities all day long means accidents and broken bones do happen on skiing holidays. Therefore, comprehensive ski holiday insurance is necessary when going on a snow skiing vacations. Due to the somewhat higher risk, most travel insurance companies do not include winter sport in their standard travel insurance policies. If you already have annual multi-trip travel insurance in place do check if it covers your snow skiing vacations. If not, you might be able to add it for increased premium but sometimes it can be worth buying separate single ski holiday for your trip. If not, you might be able to add it for increased premium but sometimes it can be worth buying separate single ski holiday insurance for your trip. Find out what exactly your Ski Holiday Insurance Should Include.